Everyone's invited to join us in celebrating the arrival of fall. 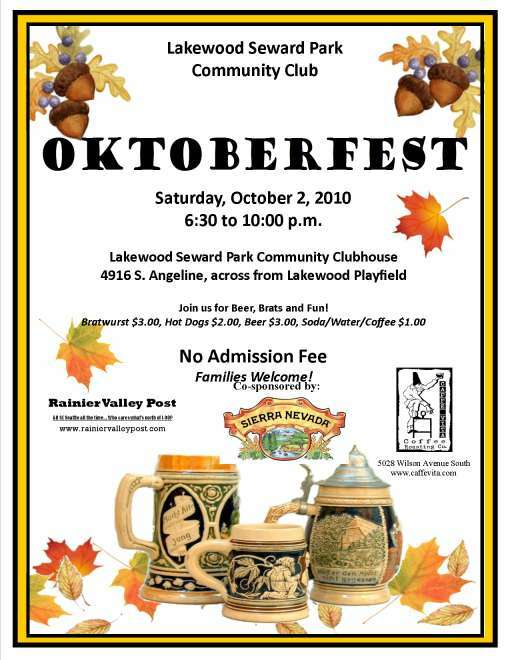 Oktoberfest at the Lakewood Seward Park Community Club (4916 S Angeline) will be Saturday October 2nd. The party begins at 6:30pm and lasts until 10:00. Brats and hot dogs fresh off the grill will be available for purchase as will frosty Sierra Nevada Pale Ale (and soft drinks too!). We may even have some fabulous raffle prizes! Mark your calendar for some neighborhood fun!